For years, Gagne's Porta-Trace Light Table has set the standard for true color, maximum light diffusion, and attractive, durable design. 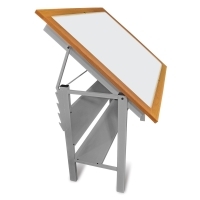 Now Gagne takes this important visualization tool to the next level with the Gagne Porta-Trace LED Light Table, boasting eco-friendly, bright white LED lights that save on energy consumption and last up to 50,000 hours. 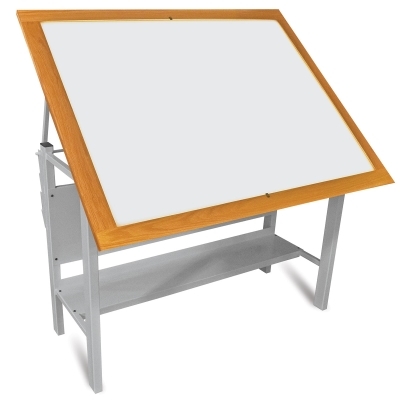 This is the only LED light table on the market. The LEDs provide excellent color quality for all artistic and graphic arts projects and are guaranteed to be equivalent to if not brighter than incandescent bulbs. The rugged and durable base is made of steel with a white powder-coated finish that resists scratches and rust. A shatter-resistant, 1/4" thick opal Plexiglas top offers wide, even illumination with minimal glare and no hot spots. The work surface can be tilted to three different angles or used in the flat position. ® Gagne is a registered trademark.